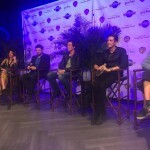 A Celebration of Harry Potter recently reunited Stan Yanevski (Viktor Krum), Natalia Tena (Nymphadora Tonks), James and Oliver Phelps (the Weasley twins) and Bonnie Wright (Ginny Weasley) at Universal Orlando, leading to discussions of their characters, the wizarding world and their latest projects! We had exclusive access to a media panel on the day of the event’s opening, which opened with the cast discussing what they were most excited for in the weekend ahead. The rides, catching up with each other and experiencing the atmosphere in the parks were all stated as their most anticipated moments at the event. James and Oliver said they were, of course, excited to see Weasley’s Wizard Wheezes once again. MuggleNet asked the cast, if they could redo any scene and add a spoof to it, what would they choose? James also said he’d like to make his voice deeper in the first films. Stan would’ve used “more realistic” exercise moves in the scene where girls were chasing Viktor by the Black Lake. As they were at a fan event, the cast were asked by Tessa Netting to share what they’re fans of. 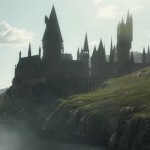 James Phelps said that as he loves The Simpsons, being at Universal Orlando during a big Potter event is great, because the Springfield section of the park is much emptier than usual! On craziest fan encounters, Natalia Tena said she was sent baby clothes once, because Tonks was pregnant! Even stranger, perhaps, James told the audience that he was once sent a watermelon in a big box with a return address and a sticker for James to write his autograph stuck onto the watermelon. He said he ate half of the watermelon and sent the (signed) other half back. (If you sent him this ‘gift’, please tweet us a photo of the signed watermelon). Stan was sent a bra with a marriage request, and Bonnie said she was once recognised in a tiny mountain village in Crete! Natalia Tena said a spell or potion to stop sexism would be very nice! James also said that he’d initially “stuff his face full of as much food as possible” when filming the dining scenes in the Great Hall, and after a few weeks he became sick of the smell of brussell sprouts and potatoes – it was probably a good thing that they eventually decided to make fake food (as seen at Warner Bros Studio Tour) for the Great Hall! And see our full coverage of the event here (opening ceremony) and here (expo and panels). We loved getting the chance to spend time with other fans and those behind the magic of Harry Potter – thanks to Universal Orlando for an unforgettable experience!